VANCOUVER, British Columbia (AP) -For two periods, it was just like old times: The Vancouver Canucks and Dallas Stars locked in a tight, defensive struggle. Then the third period started. Daniel Sedin puts home one of his two goals he scored in the third period to help the Vancouver Canucks to a 3-2 win over the Dallas Stars on Thursday night. Daniel Sedin matched the Stars' two goals in the final period with two of his own, leading Vancouver to a 3-2 win over Dallas on Thursday night. "We knew it was going to be a tight game. It always is against these guys. Low scoring," Sedin said. "But we stuck with it and got some chances in the third." Rookie Mason Raymond also scored, and Roberto Luongo made 33 saves to win his second straight game since returning after missing four due to bruised ribs. Jussi Jokinen and Antti Miettinen scored in the third period, and Marty Turco made 27 saves for the Stars, who had their four-game winning streak snapped. "It was tight and then there were a couple weird bounces," Luongo said. "A miscommunication on our part on the first goal they scored, and the puck was bouncing a couple of times right on the guy's stick and empty net. They scored one like that, we scored one like that." It was the first meeting between these teams since the Canucks won a seven-game series in the first round of last season's playoffs. Much like that meeting, the emphasis was on tight-checking hockey - at least until the clubs started trading chances in the third period. "There was a lot more goals being scored, no doubt," said Turco, who posted three shutouts in that playoffs series but lost. "When you get down you've got to press a little bit and we felt like we had scoring chances all game long and missed some golden opportunities. Louie made some good saves, too." Raymond opened the scoring eight minutes into the second period, taking the puck from the blue line down and around the net before coming out on the other side. He snapped a sharp-angle shot that appeared to go in off Turco's blocker. "Those goals happen," Turco said. "Just keep pushing and playing and don't let it bother you. Just try to get your arm out of the way next time." 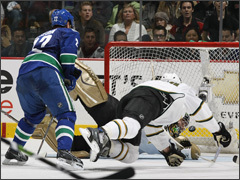 The Canucks doubled the lead three minutes into the third after Markus Naslund's shot bounced off legs in front and straight to Sedin with Turco stranded. "It was kind of an open net," said Sedin, who added his second goal on a 5-on-3, power-play rebound. "The first two periods we were in the corner cycling, and in the third we tried to get more shots and get guys in front and it paid off." Jokinen closed the gap three minutes after Sedin's first goal, scoring into another empty net after Niklas Hagman stripped Luongo of the puck as he tried to play it behind the net. Sedin restored the two-goal cushion 3 1/2 minutes later, and the Canucks appeared to go up 4-1 when Jason Jaffrey beat Turco less than a minute later. But the goal was waved off because Taylor Pyatt interfered with defenseman Sergei Zubov on the play. Miettinen scored on the resulting penalty to Pyatt, banging in a rebound of Brendan Morrow's sharp-angle shot. "It was exciting for both teams, chances at both ends, the goalies played well and it came down to a bit of a special teams game and they got the better of it," Morrow said. "Three goals is a lot to get by that guy." Notes: Luongo was credited with an assist on the first goal. ... The Stars, who beat Edmonton in a shootout Tuesday, play again Friday in Calgary. Since 2001, they are 15-4-3 when they make the three-game road trip through Western Canada. ... Luongo posted shutouts in four of his previous five home games, allowing one goal in that span.